Should I Buy a Home with Knob and Tube Wiring? Knob & Tube Wiring. What is it? Is it Dangerous? What is Knob and Tube wiring? Knob and tube wiring was the go-to wiring method for buildings from the 1880s through to the 1940s. Tens of thousands of homes throughout Massachusetts, Connecticut and Rhode Island have this type of wiring. 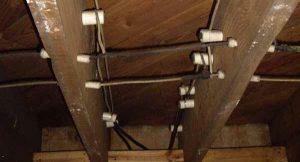 If your home was built during this time chances are it has or once had knob and tube wiring. The best place to search for the presence of this type wiring is the basement and attic. In the basement look between floor joists and at sills along the top of the foundation. In the attic search between ceiling joist and rafters. If the attic is insulated (not uncommon because the dangers of knob and tube were not known twenty years ago) lift the insulation in different spots and look beneath. If you see white ceramic knobs and porcelain tubes along and through framing members strung with two runs of wire running parallel this is knob and tube wiring. The wires were meant to stay apart from each other and in the open allowing air to circulate to prevent overheating. One of the biggest issues from our perspective is the genuine concern that insulation that is in contact with or covers up this outdated wiring can cause overheating and lead to fires. This is the main reason why so many older homes, even with today’s high energy costs, have very little insulation or none at all. Think of the energy lost in these old homes. In fact this issue is so wide spread that MassSave and EnergyWise sponsored by the utility companies in your area both offer zero interest loans up to ten thousand dollars to remove this potentially dangerous wiring allowing for new energy saving insulation to be installed. Another common trait with this wiring are two slot outlets which do not provide for a ground. Even if the old two slot outlets are replaced with newer three prong outlets there is still no third wire (thus no ground) to prevent shocks. Other common problems stem from amateur modifications done incorrectly. Always hire a licensed electrician when working with old wiring. Lastly, knob and tube wiring does not have the electrical capacity that modern families require. Today’s appliances and electronics and all the other plugged in things in our home demand much higher electrical loads than the wiring was originally designed for. Very professional and answer all my questions. They come on time and are very helpful! Recommend them to anyone. smart hard working crew who really know their stuff. kept me up to date every step of the way. would use their services all over again. Danny and his crew arrived at my home on Mon, Jan 8th. and did an amazing job. They were respectful and cleaned up as they worked. This was not an easy application. This hard working crew had to crawl into a space with little room to apply the insulation. It was difficult compounding the problem was the cold, snow, and a crawl space height of 17 inches. Nevertheless, all challenges were met and the work was completed in a exemplary manner. Would I recommend Energy Geeks and this crew to work in your home? Yes I would! I would recommend them highly. They added insulation to the attic, vented a fan and made several weatherization measures. They arrived on time, were very personable, answered my questions and did a great job. Mark and his crew were great! They arrived on time and promptly went to work. They continued working until the job was complete. They are positive, knowledgeable, efficient, well-mannered, and neat! Would I recommend Energy Geeks to others? Absolutely! I used Energy Geeks in the past and specifically requested them. I would recommend them for all of the above reasons. I am writing to extend my "kudos" to the team of insulation experts that came to my home on Friday Oct 19, 2018. Daniel and Nick were so awesome! Very customer friendly - explained everything they did and made good recommendations. I can tell the difference in how much "tighter" my house feels already. They are both great reps for your company and I highly recommend them! incredibly professional and knowledgably team. Kept me up to date every step of the way and were great about explaining what they were doing and finding while insulating. Smart, hard workers who know their trade. I was at ease with the contractors from Energy Geeks, Daniel, Ben and Dave. They were kind and considerate when I asked questions. I am very satisfied with the work that was done. I appreciate the opportunity to conserve energy that is offered by National Grid. Thank you. Professional, friendly and efficient, I was happy to work with them to weatherize my home. Excellent experience! The guys were professional and easy to work with. They went above and beyond to make sure the job was done right. I would absolutely recommend Energy Geeks! Energy Geeks were very helpful and friendly. I would recommend them. Very commendable. I recommend Energy Geeks. They were professional, easy to work with, clean during the process and cleaned up afterwards. Excellent experience, very professional and they did a great job. I recommend Energy Geeks! Very good experience. I am pleased with the job. I recommend Energy Geeks. Great experience! The technicians came right on time, were professional, and diligent in their work. I would recommend Energy Geeks to others! They are very knowledgeable. Great job. Nice workers - Nice work. I recommend Energy Geeks - they're knowledgeable, hard workers. Energy Geeks were efficient, courteous, and great communicators. I would definitely recommend them to others. Energy Geeks did a great job. They were always on time, did high quality work and went the extra mile to make sure I was pleased with the work. They cleaned up very well. I would highly recommend them. Excellent experience. Very professional and did a great job insulating the house. I would absolutely recommend Energy Geeks. Several weeks ago, your company installed energy insulation in our home. A special thanks to your employees who completed the job. They were thorough, polite and cleaned up after themselves when the job was completed. It was a pleasure working with RISE and your company! After my positive experience with your company/employees, I would highly recommend your business. Several weeks ago, your company installed energy insulation in our home. A special thanks to your employees who completed the job. They were thorough, polite and cleaned up after themselves when the job was completed. It was a pleasure working with RISE and your company! After my positive experience with your company/employees, I would highly recommend your business. Thank you. We've already noticed a difference with the house retaining cooler air when it's been hot and last night it was nice and warm during the cooler night. Thank you so much Energy Geeks for all of your hard work! It was excellent. The technicians were very professional. It seems like a good program. The work we had done by Energy Geeks has made a huge difference in the overall comfort of our home. The temperature throughout is more consistent and we were able to keep our thermostat lower in the winter and cool off the entire house faster this summer which is already saving us money. The techs that came to the house were friendly and professional and we're thrilled that we chose Energy Geeks to perform the weatherization services in our home. We recommend Energy Geeks to everyone. The Energy Geeks crew was absolutely knowledgeable, hard-working, prompt and courteous.We had our house air sealed and attic insulation sprayed on Aug. 16, during a heat wave when we were running our central air 24/7. Just got our electric bill, and it was $50 less than the previous month...an awesome savings! I've got to believe that we'll be using a lot less propane to heat our house this winter, Energy Geek was also great about protecting my carpeting and furnishings during the work, and they explained everything they were doing to seal air leaks and spray in attic insulation. I wouldn't hesitate to recommend them to others and to have them work at my home again. Thanks Energy Geeks! I feel great! Everything was done proficiently, clean. Would absolutely recommend Energy Geeks to anyone. Having my entire house weatherized by Energy Geeks was one of the best decisions I have made. I can feel the difference already! The whole house was prepped for the procedure. Technicians and Installers were courteous, neat and took proper steps to ensure dust did not escape into other areas of my house. I am very satisfied with their professionalism and on time completion. I would highly recommend Energy Geeks to anyone getting this work done! Having my entire house weatherized by Energy Geeks was one of the best decisions I have made. I can feel the difference already! The whole house was prepped for the procedure. Technicians and Installers were courteous, neat and took proper steps to ensure dust did not escape into other areas of my house. I am very satisfied with their professionalism and on time completion. I would highly recommend Energy Geeks to anyone getting this work done! I had my home air sealing done to tighten up my house and the Energy Geeks crew where great, they where on time, and they where very neat. The job went well and I didn't even know that they where there. I am completely satisfied and would absolutely recommend Energy geeks to anyone. Call the Energy Geeks to start saving money ... what a smart idea!